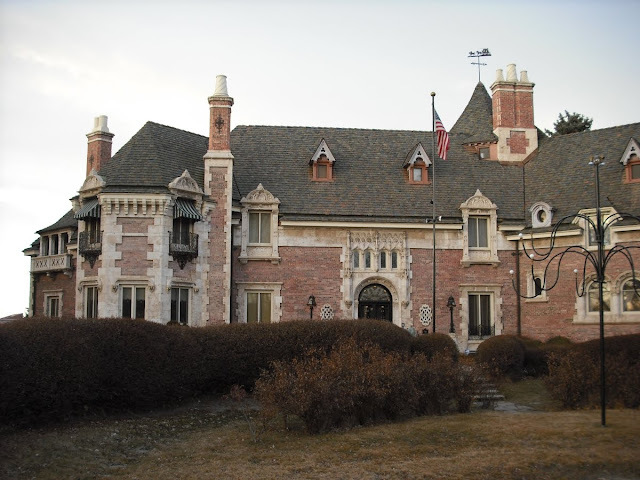 While in Colorado for a ski trip earlier this year I had a bit of serendipitous luck in discovering this house. Regular readers of this blog will know that I make it a point to do some architectural touring when I travel. On this trip, however, I wasn't actually out hunting for this house, it found me. My last day in Colorado was spent in Denver and I stayed with my Atlanta friends at their cousin's house. The cousin lives on a quiet street lined with small bungalows. As we arrived at the cousin's house I was pleasantly surprised to see this architectural beauty perched at the end of the street. It lies in such stark contrast to the other homes in its proximity. The house reminds me of one I'd see in a book about English manors or country homes. The late winter / early spring timeframe's impact on the color of the landscape heightened that feeling. As did the pea gravel driveway and the use of architecturally correct materials for the house's facade. This house has so many interesting embellishments. There's the copious use of stone for the quoins, the balcony railings, and the window and door surrounds that seems like it would be limestone. I don't believe it is though. Typically limestone reveals age by darkening up over the years from the elements such as acidic rain. And I can imagine that Denver's climate would easily instill the patina of age to limestone. That said, I suspect the stone is something else like corral stone or perhaps even marble. This close up photo highlights the intricate details in the stone and the iron railing. If you look closely, you will also see some unique touches below the eaves of the 2nd floor balcony. 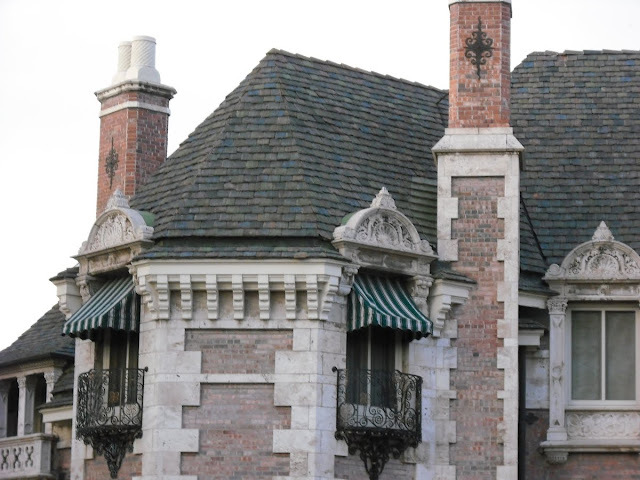 Along with the Juliet balconies, iron was used to embellish each of the chimneys. The roof is a bit of a mystery to me. It looks like slate, but has the texture of aged cedar. Unfortunately, I don't recall which it was from when I saw it in person. I'm sure I would have been able to distinguish it then. The diminutive window adjacent to the large chimney is a curious element. I wonder if that is a loft area in a 2nd floor room. It certainly seems the window was purposefully added where the roof would have otherwise continued to the the edge of the chimney. In closing I'll leave you with this photo of one of the house's two gated entrances. The stone urns stood out to me as I have an affinity for architectural urns. I tried to research the history of this home for this post but was unsuccessful in finding any details. Surely it has a storied tale. If anyone has any details about it, I'd enjoy learning of them. It's a bit over my head, well, a lot my head. Every detail has extra oomph. The roof is my favorite, sure looks like slate to me. Wow - my experience with Colorado is the rugged mountains (I mainly go there in the summer - Rocky Mountains), so this is an entirely different side of Colorado to see. Love all of the little details on the house! It is the details that make a house come alive for me. 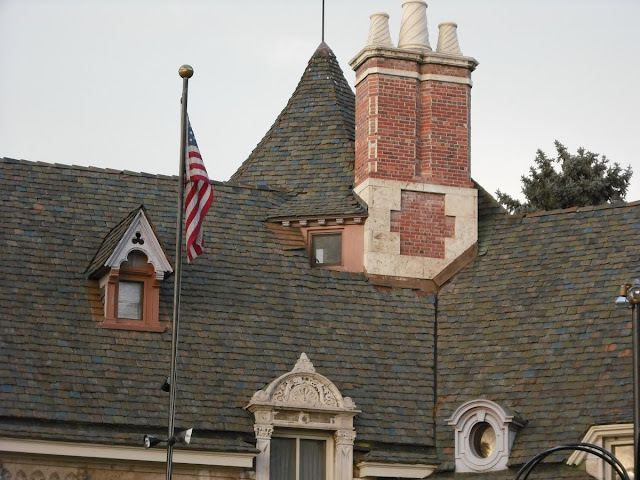 I thought the same thing as you when I saw the roof - it looks like it could be slate, but it also looks like cedar. Have enjoyed your blog so much since you started it, happy New Year! James! Wow, what foresight to take all these pictures. beautiful home, but I have to say, I was disappointed by the gate. From the first photo I thought It was a beautiful English manor, but I felt like the gate de-valued it for some reason. If that makes any sense. Roof- my initial reaction was cedar, actually... but I see the colors of slate. I'd be interested to know. Do you have any way of getting in touch with the homeowner? Love the attic room. If I live in that house as a little girl, I would totally use that window to pretend I was Rapunzel... or that little girl from the secret garden... looks like a great house for "make believe." I haven't seen anything like that here in Deer Valley yet.... but we did go to the only operating distillery last night... It has been totally redone and is beautiful. If I can get my memory card to read on this computer I will put up some pictures. 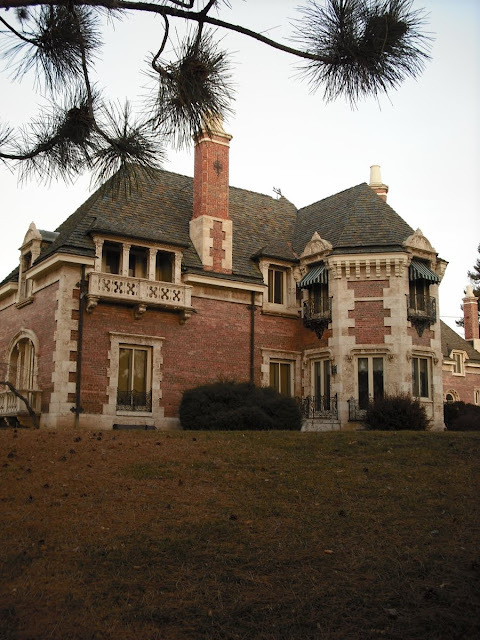 The architectural style of the house is meant to emulate 19th century French Gothic Revival. 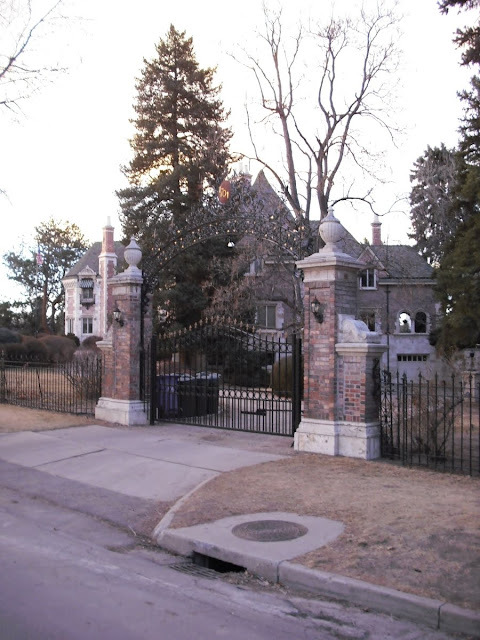 The actual gates are brand new (very cheap) but the piers, fence and iron arch are all original and their grandiose look is typical of American "Robber Baron" houses of this period. @TTI: Certainly not what I was expecting in Colorado either. @doug: I think you're right about the details being done in marble. My guess is that corral stone is more of a Florida thing. @This Photographer's Life: Agreed that something about the gate doesn't seem right. I think it might be my less than spectacular photography. That or the street not being too appealing. @Anonymous: Thank you for the info. I wondered if the roof might be clay tile after doing the post. I'm seeing that a bit lately in Atlanta. Also, I'm happy to learn of the style of the house's architecture. Now that you point it out, it makes sense. Wow James - What a find ! 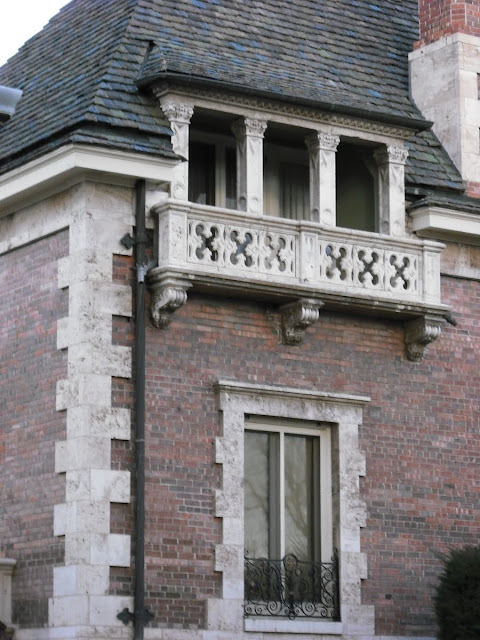 Since I am a lover of Wrought Iron, I love the Juliette balconies, and iron embelishments on the Chimney - Fabulous. I agree that the front gate is a bit of a disappointment.. but none the less, a very interesting home. Happy New Year James..Have a Wondeful 2010! 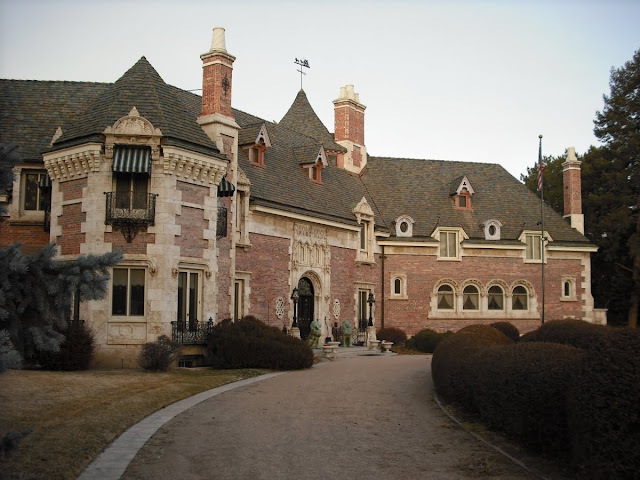 I remember seeing this house when it first went on the market in Denver after it's completion around the late 1980's.They called it the French Chateau,and the asking price then was $10 million.I faintly remember pictures of it's interior,but the outside was more impressive than the inside.It would be difficult replicating a home like that today,simply because the cost would be astronomical.Even the very rich don't stay in homes like that very long.They end up being money pits.